If you’re driving past Sandpiper Golf course on Hollister Avenue, you can’t help but notice this distinguished looking building, standing proud among the weeds. 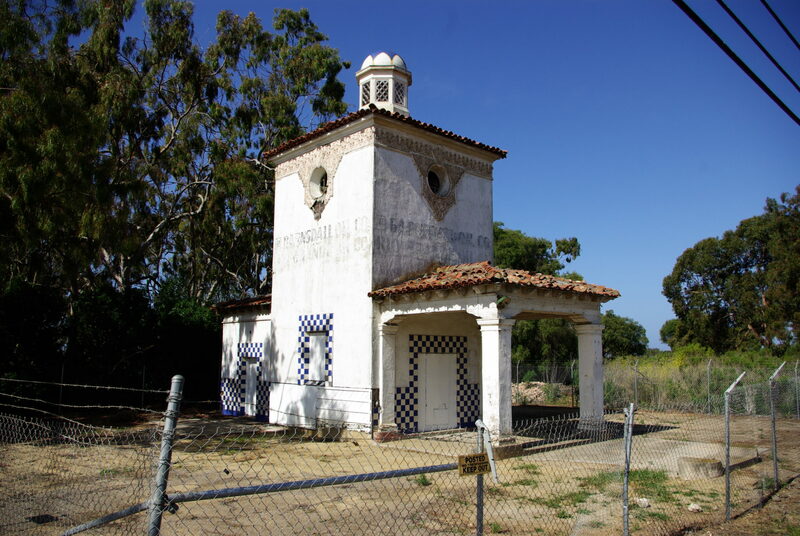 An almost forgotten landmark in Goleta, the Barnsdall-Rio Grande gas station is a reminder of a simpler time. Located beside what was once a vast oil field, the building is showing it’s age, but it’s a very unique structure and its elegant architecture is still evident today. It’s a product of a time when “green” was just the name of a color. Oil was big money, and the Barnsdall-Rio Grande oil company was making plenty of it at Ellwood. In 1928, an oil strike quickly made the little company a major player on the New York Stock Exchange, and almost overnight, they were the county’s biggest taxpayer. 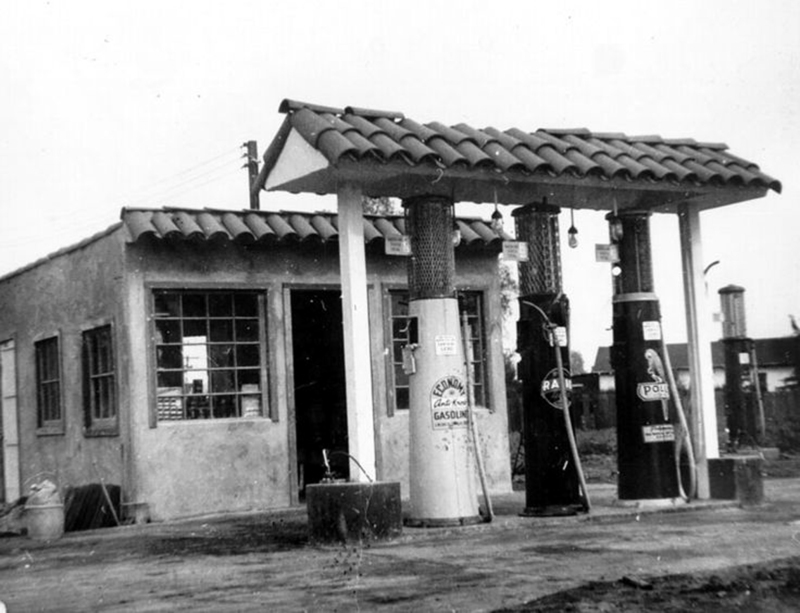 Most “filling stations” at the time were plain, unattractive, boxlike structures. When Pearl Chase began her program of civic improvements to the Santa Barbara area, she wanted to upgrade their appearance. Many buildings were constructed in the Ellwood area to support the booming oil fields, but when Barnsdall-Rio Grande decided to build a filling station on the State Highway adjacent to their booming fields, they wanted it to be a showpiece. Pearl Chase was surely pleased. An exclusive architecture firm out of Los Angeles was selected and the product of their efforts was completed and opened for business in 1929. A classic example of Spanish colonial revival architecture. Standing 40 feet high, the white plaster walls, blue and white ceramic tiles and red mission roof tiles made quite a flagship. In the years to come, the station would win several awards for it’s beauty. And despite years of neglect, the beauty of the design still shines through. In 1931 the Barnsdall- Rio Grande added a restaurant next door. It was called “Wheeler’s Inn”, named for the husband and wife that ran it. Eventually they added a family apartment and a liquor store. This location became a popular meeting place for locals and travelers alike. A fairly regular customer at the station and the restaurant was William Randolph Hearst, who made Ellwood a midway stop between Los Angeles and his little place up at San Simeon. This is Wheeler’s son, Marshall, looking pretty pleased with his sweet Oldsmobile. In 1942, a Japanese submarine bombarded the Ellwood field, sending shells whizzing by the gas station and some landing in close proximity. Their attack caused no real damage to the facility, but it did have a devastating effect on Wheeler’s Inn. After an initial swarm of curious sightseers, fears of a repeat attack and local blackouts forced the Wheeler’s to close up shop and relocate to 37 E. Victoria St. in Santa Barbara. The rerouting of Highway 101 was completed in 1947, bypassing Ellwood and isolating the Barnsdall-Rio Grande filling station from traffic. By the early 1950’s, the station was closed. It did relive it’s former glory for one brief moment in 1980, when United Artists used it in a scene for a remake of “The Postman Always Rings Twice”, starring Jack Nicholson and Jessica Lange. A while back, we found a construction crew surveying the building. They mentioned the owner restoring the building to it’s former glory, but so far, nothing has happened. With all the growth around it, it would seem like a good place for a business venture or a museum perhaps? Hopefully someone will save it from it’s slow decay and this piece of Goleta history will live on for future generations to enjoy. Sign the petition to help preserve this beautiful building. * Old photos and information provided by Gary Coombs and Phyllis Olsen, from their book, “Sentinel at Ellwood”, 1985. New photos by Goleta History.com. Get a cool shirt with an original sketch of this building and make a donation to Ellwood School at the same time! At one time Tex Blankenship operated that station. I still have some of the brass from one of the shells that landed just past there! That piece of property is a landmark to Goleta , there are not many left . It would be a travesty to tear it down . Please , please ,please save this this building it can be a landmark for many generations to come . Save the history there is not many physical sights left to see in California.This is one beautifull building worth preserving. Let it be!!!! My grandfather, P.G. McNeil leased there for some time. I would hate to see it go. It deserves to be preserved! That’s amazing! Thanks for sharing that info, very interesting. The blue and white square tiles gracing the windows and doorways are also seen on the Ellwood Elementary School and Santa Barbara Zoo entrances. I drive by this beautiful Barnsdall Oil structure every day. It is an architectural treasure. Does anyone know what the latest is on preservation efforts? I am an artist and I came across a picture of it with caption, in one of my art books. The artist, Glenna Hartmann, painted in pastels, this alluring, mystical abandoned building which I have fallen in love with. I must now take a trip, from my home in Fenwick Island DE to this location. Is it for sale? Does anyone know? And had it been remodeled? You are not alone in your enthusiasm for this old beauty. Countless artists and photographers have recorded their impressions of it and the citizens of Goleta signed a petition saying they want it saved. The owner, Ty Warner, has promised to donate it to the city of Goleta. So hopefully that will happen soon and our city leaders will come up with a suitable plan to refurbish and preserve it for all to enjoy. I have some memory of going with my mother to deliver dinner to my grandfather (William K Stronach) as he was loading oil to an oil tanker in the early 50’s. At that time there was only 1 short pier and the ship was off shore a very short distance. Oil was pumped to the ship and my grandfather was one of a couple guys that knew that job. We could hear from our home in Goleta the communication from the ship to the pump operator because it was done by Fog Horn. That was a several day task in that day. Great memory Eldon! Thanks for sharing! Any photos? This gas station was one of the last impressions in the life of famous film director F. W. Murnau, 1888 – 1931 (films: Nosferatu, Faust, Sunrise, Tabu etc.). In afternoon of March 10th. 1931 his driver of the rented Packart take in petrol at this station. Only a few miles distant the fatal motor accident happend – Murnau died in the night of this day in Santa Barbara Hospital. The reason for the accident was, that Murnau `s man servant – a very unexperienced young driver – from this gas station drove the car and lost control after a few miles later. I think, alone of this point it will be important, that the station will be preserved and restored. Thank you for this fascinating bit of motion picture history! I had no idea…. sometime before they put up the fence, I stopped there and took some pictures. None as good as these. Recently, with out actual measurements I built, or tried to build several scale models of the station. Since my wife wasn’t interested in a road trip, I didn’t get back up to see the station again. I asked an acquaintance about it, as he, for work had to travel by it twice a week. He said it was gone. I was depressed, but now quite over joyed. Photos of the adjoining building would be of interest. Yes it’s still there and hopefully will be taken over by the city soon! We would love to see your model version when you get it done. There are no adjoining buildings, just the one solo station. take care.